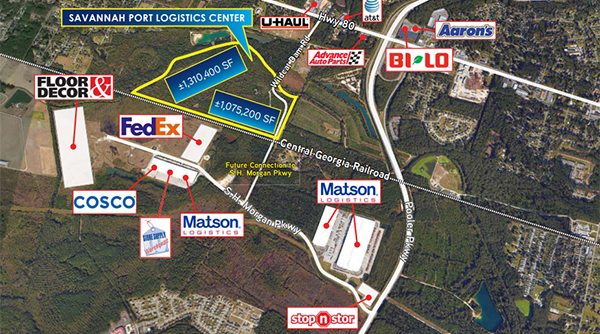 Capital Development Partners said it will build the $125 million Savannah Port Logistics Center in Pooler, about 10 miles from the Garden City Terminal. The 197-acre complex will include more than 2.3 million square feet of warehouse space. Container traffic through the Savannah port grew to a record of nearly 4 million twenty-foot-equivalent units (TEUs) in fiscal 2017. That figure is expected to grow as work continues to deepen the Savannah River channel and as larger classes of freighters call on the port after passing through the expanded Panama Canal. Georgia’s inland and coastal ports are vital cogs in the state’s economy. Georgia’s ports system accounts for some $40 billion in estimated economic impact across the state, and directly or indirectly touches about 400,000 jobs. Savannah has seen a surge in warehouse development to help accommodate the movement of imports and exports through the port. But space remains tight. The vacancy rate for warehouses in Savannah stood at a scant 3% at the end of December, according to a report from real estate services firm Colliers International. About 5 million square feet of space was under construction in the Savannah area at the end of the year, the Colliers report said. Space is even tighter for the newest generation of industrial buildings, said John Porter, CEO of Capital Development. Land near the port with ready highway access and that’s served by CSX and Norfolk Southern rail lines also is rare. Another dynamic is e-commerce and merchants’ desire to have product they can get to consumers fast. The developers plan to start the first phase next month, including a more than half-million-square-foot building that could be expandable to more than 1 million square feet. A second phase is expected to start later this year. In February, ports officials announced the agency was developing a 10-year, $2.3 billion expansion plan that would allow the Savannah port to accommodate 10 million TEUs. The Army Corps of Engineers announced this week that the nearly $1 billion project to deepen the Savannah River had reached its midpoint. State officials are pushing for more funding from the federal government to help ensure the project remains on schedule. The deepening project is scheduled for completion in 2021.